Long-time Emory Healthcare nurse, Marilyn Margolis, is the 2013 Lifetime Achievement Winner from the Georgia Hospital Association. Emory Johns Creek Hospital CEO Craig McCoy nominated Margolis for the GHA's Lifetime Achievement Award this year. 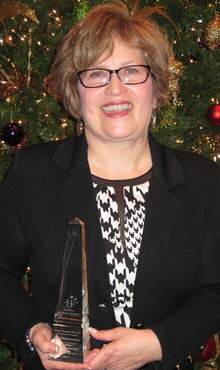 Emory Healthcare's Marilyn Margolis, RN, was awarded the 2013 Lifetime Achievement Award from the Georgia Hospital Association at their Dec. 10 Hospital Heroes Luncheon. Margolis, who for more than 30 years at Emory has cared for patients, taught students and developed innovative new patient safety and nurse retention models, currently serves as chief nursing officer and vice president of patient services and operations at Emory Johns Creek Hospital. Margolis began her career at Emory in 1982. As a new graduate and staff leader in the Coronary Care Unit at Emory University Hospital, she coached charge nurses and mentored staff. She soon was promoted to clinical leader for her shift. She was integral in serving the patients' needs and was an early innovator in patient-centered care. Margolis continued her journey with Emory Healthcare, and in 1999 she became unit director of the Emory University Hospital Emergency Department. There, she was responsible for all aspects of management and operations, overseeing a staff of 100 and an operation budget of $10 million, as well as ensuring optimal patient care. While holding this position, she developed a model with the medical director that significantly reduced the wait time for patients to see a physician, and that effort resulted in increased patient satisfaction. She facilitated the reorganization of the admission process in the ER, implemented an "express care" line, which improved patient safety, and reduced patient-to-nurse ratios. "I have worked with Marilyn for over 15 years and what strikes me is her remarkable heart; she truly cares about people: her peers, colleagues, patients, families and friends," says Douglas Lowery-North, MD, vice chair for Emory's Department of Emergency Medicine. "As she has grown through the ranks, she has not waivered on this being her true north and this is what inspires others to be better and to want to be a part of her team. She continues to impress me with her unending enthusiasm, incredible work ethic, and unremitting commitment to excellence. Marilyn is truly a shining star in the Emory network." In 2002, Margolis was named director of nursing for Emory Healthcare's Emergency Services, which included emergency services at Emory University Hospital Midtown. She was responsible for a $20 million operating budget and 200 employees. During this time, Margolis lead initiatives to increase patient satisfaction scores and improve nursing staff retention. She served as a team leader and champion for University HealthSystem Consortium (UHC) implementation for best practices, which resulted in system-wide improvements, followed by recognition by UHC. UHC is a national organization comprising most of the nation's leading academic medical centers with a focus on quality and safety excellence. In 2003, Margolis was part of a team at the Emory University Hospital Midtown emergency services in a $216 million re-development project of its emergency department. Her achievements landed her in the role of director of nursing for neurosciences at Emory University Hospital from 2006 to 2007, while still overseeing system-wide emergency services. That position expanded her duties to oversee four intensive care units, a neurocritical care intermediate unit, two 24-bed neurology/neurosurgical bed units, a general surgical ICU and a surgical floor, including bariatrics. She was responsible for a $60 million budget and an additional 180 employees. She was promoted to director of nursing operations in 2007 at Emory University Hospital, in which Margolis oversaw flow coordination and operational issues, as well as quality and patient- and family-centered care models. During that time, she led a successful JCAHO (Joint Commission) Stroke Certification Team in 2008 and re-certification in 2010, with no findings. She also assisted in opening a 10-bed epilepsy monitoring unit and an eight-bed inpatient hospice unit in collaboration with Vista Care. Her current roles at Emory Johns Creek Hospital, in which she began in 2011, allow her to collaborate with all providers and have oversight for all clinical and operational functions. She also provides guidance and leadership in the development and implementation of patient care and establishes the standards for patient care, nursing practice and nursing performance. "Marilyn is a tremendous leader at Emory Johns Creek Hospital and her guidance and style of management are well respected by staff and physicians alike," says Craig McCoy, CEO of Emory Johns Creek Hospital. "During her tenure here, she has led initiatives for the hospital to become a Primary Stroke Center, become an Accredited Cancer Program (with commendation by the Commission on Cancer of the American College of Surgeons), receive the GHA Chairman's Honor Roll for Quality and Safety (for which the hospital has won four years in a row) and receive ICAEL accreditation in echocardiography." Margolis received the only 2013 Lifetime Achievement Award from the GHA. Ten other people in Georgia received GHA Hospital Hero awards.